Am I improving my strategy? This weekend I got some marketing advice from a 13year old. “Do you have Instagram? You need Instagram!” I loved it. This wasn’t for Digitalie, but from my other company. I sell Stampin’ Up! products under the name Het Knutsellab (The Crafting Lab) and I also give creative workshops. Something completely different than marketing, but you still need marketing. And this 13year old girl was addicted the moment she laid her eyes on the products! She couldn’t be pried away from my booth and was wishing desperately she had known about the products earlier. She wanted to tell her friends and sisters and everyone else on the planet. And she was the one giving my marketing advice, telling me I should share this on Instagram. That this girl recommends Instagram to me isn’t all that weird. For youngsters like her Instagram is more important than Facebook. Instagram is the social network (together with Twitter) where they communicate. Sure, they still hang out on Facebook but other channels are much more important to their social networks. 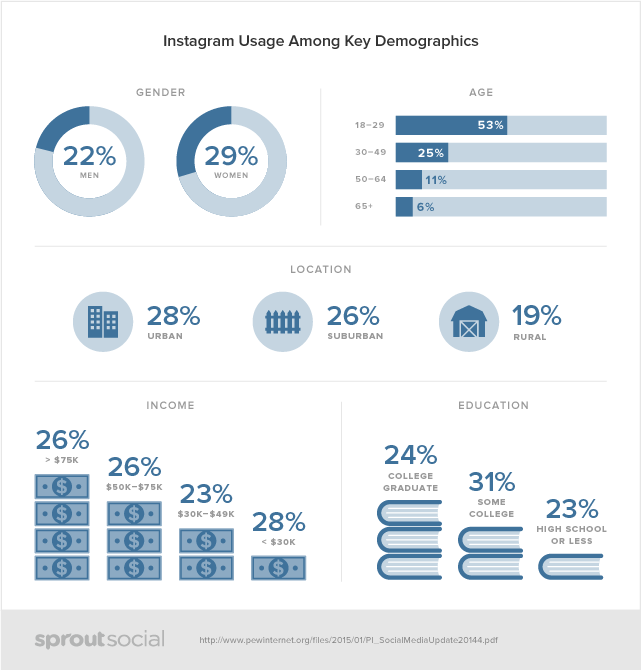 Under 18-29 year old Instagram is still populair but then the popularity declines fast. I always thought of my audience for Het Knutsellab as females between 30 and 70, who love to be creative. Beginner or advanced doesn’t matter. And so I chose Facebook, Pinterest and YouTube. 3 strong channels for that creative, female target audience. And important channels if you are business2consumer. It never once occured to me to target the younger crowd. Because of the quality the price isn’t low and therefor I assumed it was more for the mature crafter than the young enthusiasts. And so I didn’t pick Instagram. And now? Now I will check my strategy. Will I target the youth too because of this very enigmatic, keen young girl and join Instagram? Or will I persist with my intended target audience and keep my marketing the way it is now? Did you check your marketing strategy lately? Ever thought about your target audience and whether it could use a tweak? What did you conclude?